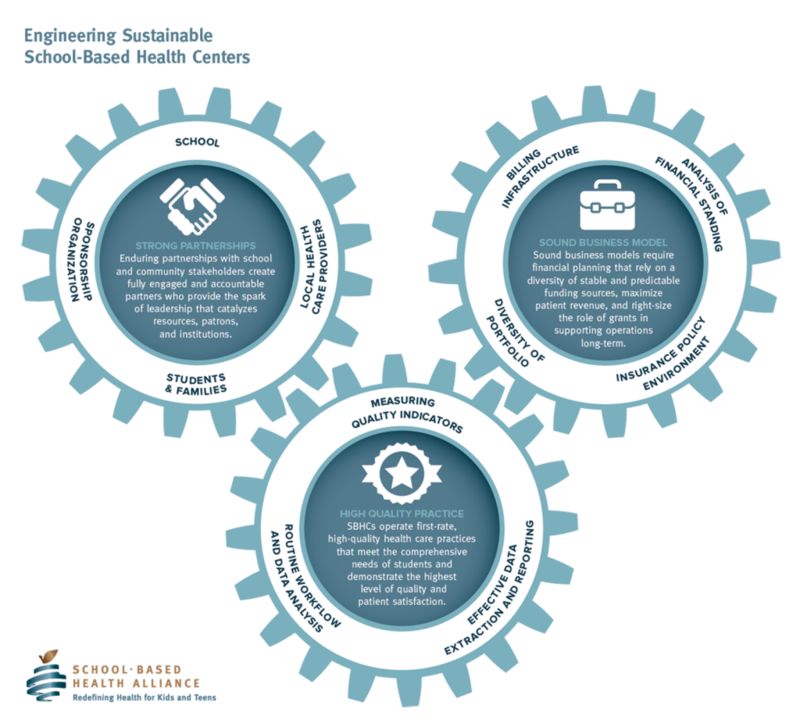 What Makes a School-Based Health Center Sustainable? Develop and nurture Strong Partnerships with school and community stakeholders committed to SBHCs. Create a Sound Business Model that relies on a variety of stable and predictable funding sources. Operate health care practices that meet the comprehensive needs of students and demonstrate a High Quality Practice. Each of these aspects is interdependent and of equal importance. Underdevelopment of any of the three can weaken a SBHC’s long-term sustainability. A more detailed description of each aspect is provided below. Collaboration is essential to the model’s long-term success. Engaged and accountable partners provide support and resources that contribute to a sustainable SBHC. School: When SBHCs coordinate and collaborate with school administration, teachers, school nurses, psychologists, and counselors, integration into the school follows. When the SBHC becomes an integral part of the school great things happen – attendance improves, chronic conditions are better managed, and behavioral conditions get quick expert attention. Students and families: When SBHCs engage students and their families, they become SBHC champions. They play a critical role in marketing, advocacy, enrollment, and resource development. Local health care providers: Partnering with community-based health care providers and organizations leads to in-kind contributions of staff or resources, health care trainee internships, patient information cross sharing, referrals and linkage agreements for specialty care, and marketing/promotion of SBHC. Sponsoring organization: Select a medical sponsor with a mission that aligns with the school’s mission, culture, and priorities. Potential medical sponsors may include federally qualified health centers (FQHCs), hospitals, local health departments, academic medical centers, solo practices, behavioral health agencies, and even schools. Each brings distinct advantages and disadvantages to the table in terms of revenue opportunities and administrative strengths. Sustainable SBHCs employ sound business practices including an up-to-date business plan and financial plan. Together they result in a successful business strategy and a diversified portfolio of stable and predictable funding sources: patient revenue from Medicaid, other third party insurance, and patient fees; in-kind contributions of staff and resources; and local, state, federal, foundation, and corporate funding leading to a sustainable SBHC. SBHC business plan: Developing and implementing an SBHC business plan helps assure that the essential components for creating a sustainable SBHC program are in place. It includes an executive summary, business overview, operations and management plan, personnel and resources, marketing strategies, competitive niche analysis, financial analysis, risk management, and exit strategy. You can also use the individual components in grant proposals, presentations to potential funders and community partners, and accountability reporting to funders. SBHC financial plan: Conduct a financial analysis of your SBHC’s standing to determine overall program costs, cost per enrollee, cost per visit, and cost per type of visit. Start with a detailed SBHC cost analysis that includes demographics of population served, utilization, and actual and in-kind revenue and expenses for staffing, facilities, equipment, supplies, lab, pharmacy, administration, billing, liability insurance, travel, and indirect costs. Use the results to complete an SBHC pro-forma financial plan with projections for the next three to four years. Infrastructure for billing and collections: Billing and collections policies and procedures, assigned staff, and an electronic health record with an integrated billing system is essential for efficient patient and third party insurance billing and collections. Contact your state’s Medicaid program to develop expertise in public insurance policies, including eligible providers, covered services, and reimbursement. Establish contracts with Medicaid, Medicaid managed care organizations, and other commercial insurance carriers to maximize reimbursement for services. Assist uninsured patients enroll in Medicaid or other insurance plans. SBHCs operate health care practices that respond to the comprehensive needs of students and demonstrate the highest level of quality and patient satisfaction. Achieving a first-rate, high-quality patient-centered health care practice requires attention to every dimension of program performance, including measuring clinical and business quality indicators, data reporting, and routine workflow and data analysis. Quality Improvement (QI), a system-level, iterative approach, achieves and maintains benchmarks by identifying workflow challenges, facilitating planning and testing interventions, assisting with analyzing results, and tweaking interventions based on results. Measuring quality indicators: The Alliance recommends a set of national SBHC clinical performance measures in alignment with other national clinical performance measures including HEDIS, CHIPRA, and UDS. Click here to visit the Quality Counts Playbook. The Alliance also recommends a set of sustainable business measures. Click here to visit the Sustainable Business Practices Playbook. Effective data extraction and reporting: Efficient quality improvement efforts require electronic health records including practice management systems that collect and report data you need. Whatever data you elect to include (quality measures, cost-per-visit, encounter rates), be certain to input and extract data that is meaningful, actionable, and sharable with clinic staff, sponsors, and key stakeholders. Routine workflow and data analysis: Ongoing analysis of clinic workflow and data selection/reporting results in successful QI efforts. The MEMBER ONLY Blueprint, contains links to additional editable resources to assist you.